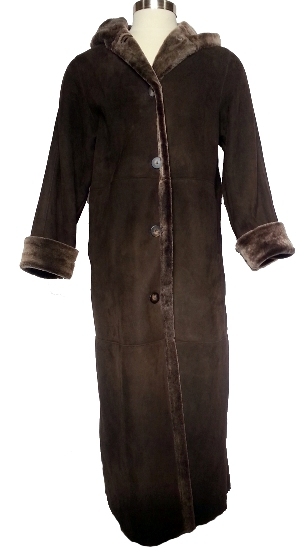 This full length Shearling coat has a built in hood, slant pockets and is fitted, so it tapers in at the waist. There's an additional button under the collar, so it can be closed all the way up and the sleeves are adjustable. Turned back edge runs down the front of the coat on both sides. Made with Spanish Merino Brown Blist pelts.